I'm a pretty lousy golfer so I don't even bother with the "Get A Hole In One And Win a Prize!" chances, though I do wish I could go all Tiger Woods and take home a new ATS or something. 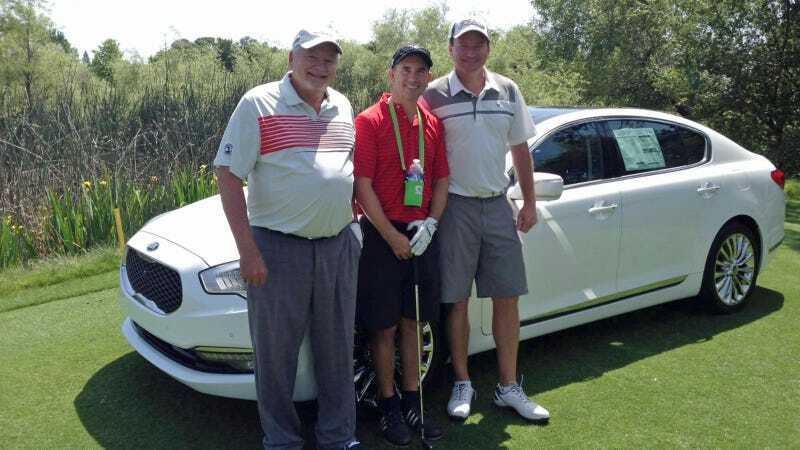 One golfer managed to sink his ball in one shot and thought he won a Kia K900, but the dealer won't give him the car. On May 7th, Allen Ross was playing in a charity golf tournament when he sunk a lucky shot on the third tee. Immediately the tournament organizers posed with Ross and the $66k Kia K900 that was parked near the tee. Naturally, Ross assumed he had won a the car. It wasn't until the next hole did someone tell him that he had actually won 25k. The dealership had taken an insurance policy out on the hole-in-one contest for 25k to use as the prize and the Kia was only a display piece. Ross hired an attorney to sue Folsom Lake Kia and Ford for what he claims is a "bait and switch." "The actual hole-in-one signs conspicuously state in oversized font that the hole-in-one prize is a 'New 2014 Ford or Kia' and does not state 'this' or 'this vehicle' is the award vehicle. It was never implied or presented that the display vehicle was part of any award/prize and/or valued item associated with the golf tournament. It was 'DISPLAY ONLY.'" Ross and others that played in the tournament claimed there was no such disclaimer. "Generally, and I've played in a lot of tournaments — if there's a car on the tee, it's kind of an accepted thing that's what you're playing for," Ross said. The story gained traction with local news outlets, and Folsom Lake Kia and Ford is now placing blame with the organization that sponsored the Eureka Schools Foundation (ESF) for displaying a vehicle that was significantly above the prize limit and for not putting the prize limit on the player's sheets. The dealership also claims that the insurance company failed to provide adequate signage at the holes that clearly stated the prize limit. Jon Peterson, general manager of the dealership, has said that the dispute will get "resolved."